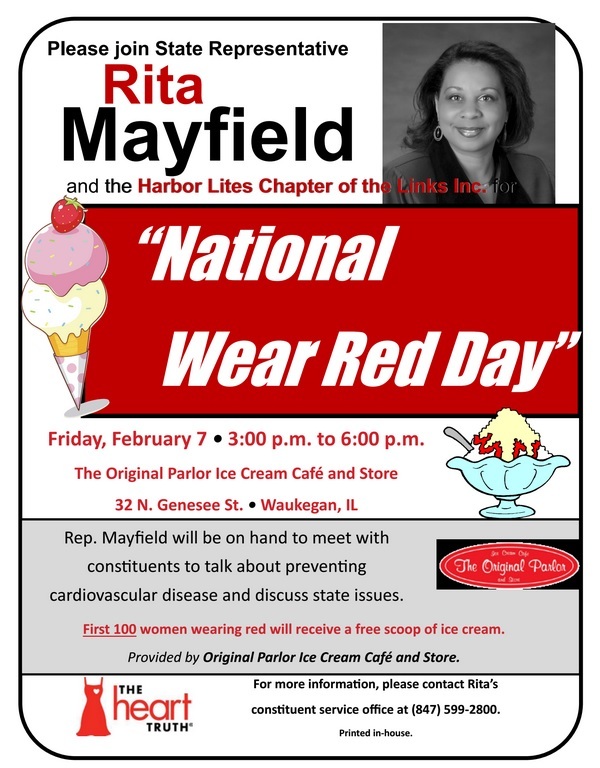 Please join 60th District State Representative Rita Mayfield and the Harbor Lites Chapter of the Links INC for National Wear Red Day. Friday February 7th, 3:00 pm to 6:00 pm at The Original Ice Cream Cafe and Store located at 32 N. Genessee St. downtown Waukegan. Rep Mayfield will be on hand to meet with constituents to talk about preventing cardiovascular disease and discuss state issues. The first 100 women wearing red will receive a free scoop of ice cream. For more information please contact Rita's constituent service office at (847) 599-2800.